20 out of 25 Paid Search experts mentioned Audiences as an important PPC trend to be aware of in 2018. So why do I hear time and time again from clients that “audiences don’t work” for them? Audience strategy can be complicated, and difficult to measure or execute, but it doesn’t have to be! If you’re interested in capitalizing on performance improvements from audiences in 2018, but not sure how to make it work for you, keep reading for fixes to three common audience woes. If you use Google Analytics, there is an easy way to build audiences in GA and export them over to AdWords. You have all the functionality of an RLSA audience without the hassle of placing a new tag. Get instructions here! If you don’t use already use GA, there would be similar hoops to jump through to get the GA tags implemented. Another audience option to try is loading emails to create a Google Customer Match Audience. A tip from one of our expert Analytics Solutions Engineers: don’t forget about the option of using tag management! Remarketing tags can be deployed in minutes instead of weeks if you use a tag management solution, and there’s no need to have to set up a GA AdWords integration if you can just place the tag where it’s needed. Unless your site gets less than 1,000 visits per month, you should have no problem creating audiences large enough for Google to target. Your problem is likely that you’re starting off with audiences that are too specific or have a duration window that is too short. Start broad, like a 30 day or longer All Site Visitors audience. Create and apply this audience across all of your campaigns with the “Observation” setting. This will allow you to gather data on these users. Once you begin to see traffic here, you can get more specific with your audiences. 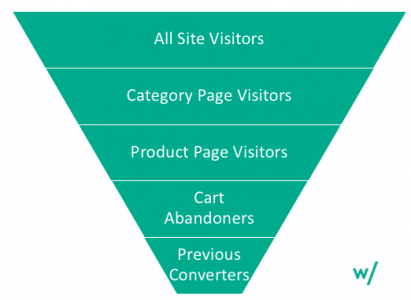 The basic conversion funnel below can typically be used across any client in any vertical with a few tweaks. Tip: Stay away from building audiences for more obscure, one off initiatives, like a giveaway page for example, until you have a good idea of how much traffic your normally receive through RLSA. These types of audiences are often too small to target, and you’ll waste valuable time and resources getting it in place. A final word of advice here: if your 30 day All Site Visitors audience size is significantly smaller than the number of sessions you typically receive on a monthly basis, your remarketing tag is likely not placed on all pages across your site. Raise a ticket with your IT Development team to double-check this. If IT resources are tight, check out alternative audience sources above. You have your audiences created, with plenty of users to target, but when you look at the adgroups or even campaigns where audiences are applied, none of them have significant data. That’s okay! Meet your new best friend the pivot table. Group your campaigns or adgroups in relevant segments. 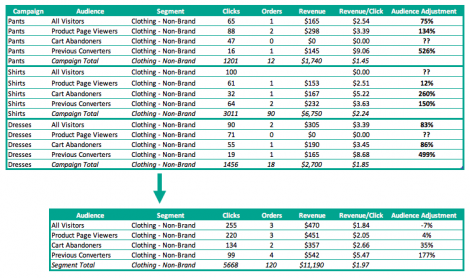 I often break down campaigns into Branded Search, Non-Branded Search, Branded Shopping, and Non-Branded Shopping. Aggregate audience data across these segments. Keep in mind, you’re looking for trends in user behavior. While you may lose a little bit of specificity by looking at how “Cart Abandoners” perform across all “Clothing”-related keywords, as opposed to how they perform on “Pants” vs. “Shirts” vs. “Dresses”, you will also lose the data noise, your decisions will be more sound. If specific campaigns or adgroups DO have significant data, feel free to pull them out and aggregate everything that remains into relevant segments. Have you run into other Audience Problems? We’d love to hear them and understand if there is a way we’re able to help!